Kalil and I were in bed just last night and at about 8 p.m. we heard firecrackers outside our bedroom window. Several rounds of fire crackers-crackle, boom, swoosh. We just laughed hard, what are they celebrating? Sunday night in the Fruitvale! I grew up in the South Bay and just a few days ago marked 43 years since my family (im)migrated from our beloved Michoacan Mexico to the Bay Area. My childhood in the South Bay grounded me as a brown- skinned, working class, (im)migrant bilingual kid surrounded by a blending of all cultures. Now, 43 years later, I can appreciate it that much more here in the Fruitvale neighborhood of Oakland. Or Huichin as the original protectors, the Ohlone call it. As I was growing up in the 1980’s in my small ,ever- changing neighborhood aptly called Castro City in Mountain View, the face of Oakland/Huichin, especially the East side was changing as well. Just like the great migration of the 1940’s turned Oakland/Huichin into a predominantly Black/African -American town, starting in the 1980’s, my fellow Mexicans and other Latinx folks began to migrate in higher numbers, changing Oakland once again. Fruitvale, the neighborhood that reminded me of home the very first time I visited , has consistently been a neighborhood filled with folks from all over the world. Loud blaring music usually playing hip hop, banda or reggaeton permeate the streets. One Saturday night this past summer, there were at least five parties happening in my immediate three- block radius; three of those parties had a live band present. Folks get down here. My upstairs apartment in the grey four plex on Foothill Boulevard, close to the corner of 28th Avenue, is my tenth home in Oakland/Huichin. I have been in the Fruitvale for over four years, and 18 years as a resident of Oaktown. It’s this home though that has helped me be a more mindful, grateful and humble person. When I walk out of my door in the morning to head to the Oakland YMCA in downtown, I jump in my truck and drive past many jornaleros/day laborers on the corner of Fruitvale and Foothill. Trucks are picking some of the men up; other men are just waiting. While they get to work, I get to work out. Privilege for sure. Today I walked over to pick up a tomato and some toilet paper from one of my many corner stores. Back in the day, the corner stores/mercados were owned by Latinx folks, now they are predominately Arab- owned, at least in my stretch of the neighborhood. On the corner of Fruitvale and Foothill at Mi Rancho, I picked up my items and as I was walking to the register to pay, I heard this loud grito/shout from the back of the store, just as a banda song is blaring. The fitting part was that the grito/shout came from the young owner’s son, who is most definitely not Mexican but Arab. I shouldn’t be surprised if that young man can speak better Spanish than I can, so of course he can do a proper grito/shout on cue. Cultural intersection yo. 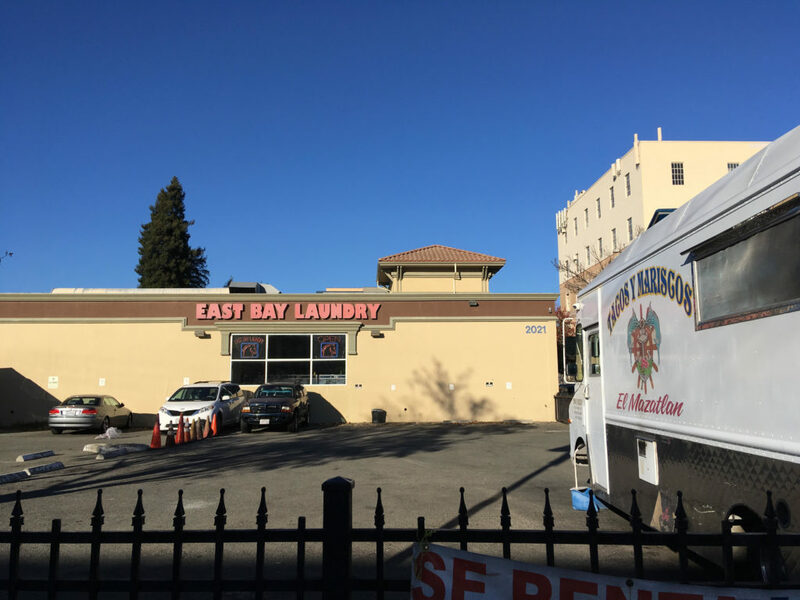 Kitty corner to the store is the East Bay laundromat. There are many of them around the Fruitvale-damn like we are the hood with the most clean clothes or something. One time at about 6:50 a.m. I saw this nicely- dressed brown man with his bundle of clothes waiting for it to open at 7 a.m. and I couldn’t help but giggle loudly to myself. It is here that many of my neighbors gather. On this trip I got to speak with Jose who lives around the corner from me on Rutherford and Foothill Blvd. in the apartment complex that is filled with brown people. 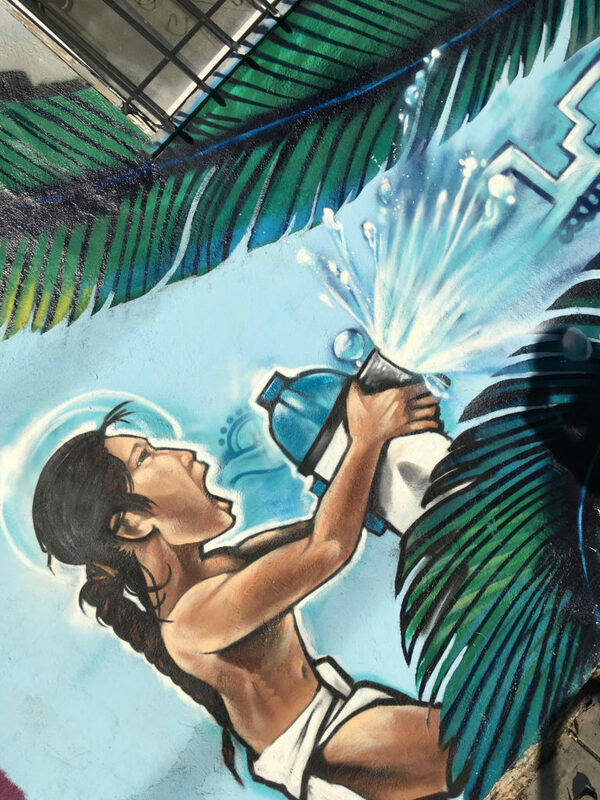 It is across the street from the apartment building that was constantly getting rammed by cars and had big ole holes in it; now it has a mural, courtesy of the folks from CURYJ. Jose is from Queretaro Mexico and sells all sorts of trinkets at the laundromat. I find out he is a janitor at Apple in the South Bay. He is very nice and is always saying hello to me wherever we see one another. We chatted and he asked me about my job; he needs a good dental referral while he waits for his insurance to kick in. Just today I found the piece of paper with his number and realized I haven’t come through for him yet. I walked home past the publishing spot that has set up shop-putting a planter box and a bicycle rack where there used to be a parking spot. The plants are not thriving and not one bicycle has ever parked there. A sign of a new neighbor unaware of what could be of use instead of that pinche bicycle rack. Let’s not even talk about that ridiculous mural they have put on the side of the building featuring an African-American girl with doll eyes saying something about being scared. No me gusta. Not Oakland. My favorite business owner on my block have to be the florists with a shop almost on the corner of Austin and Foothill. They are brown and gay and beautiful. They rent out the back space for parties. And every now and then their parties turn into all -night karoake. You know, even when some obnoxious singer wakes me up, I can’t help but crack up as I try to get back to sleep. My part of the Fruitvale is quiet at times and today as the wind is blowing through the streets, I realize the leaves have changed as does this neighborhood. One person at time, a home and whole blocks evolving.